Facility Builders and Erectors has completed construction on the Brea War Memorial, one of our recent design build projects. Facility Builders and Erectors was awarded the contract to build the Brea War Memorial at the City of Brea for Narduli Studios. 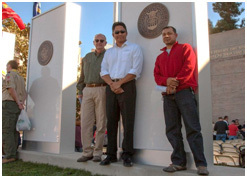 The memorial, designed by Susan Narduli, represents the five branches of the United States Military and honors Brea's fallen heroes and veterans. With this design build project, Facility Builders installed a walk of honor, five military branch monuments, an 18 ft. tall reflective granite monument and landscaping. The walk of honor, stretching 120' long, was made of stone pavers engraved with the names of Brea's veterans accented with a bronze inlay. Tradesmen, with extensive experience, laid stone pavers to the artistic specifications of Narduli Studios. The five military branch monuments were made of white marble, backlit by an LED panel. The monuments represented each military branch of the U.S. and featured aluminum cladding and steel framing sitting on a grass berm. The 18 ft. tall reflective granite monument, engraved with the names of fallen soldiers, is steel framed with a smooth stucco finish. The monument was constructed of three pieces of granite (cut and polished). A vertical groove was cut @ 10' down for visitors to slide personal notes in. Facility Builders and Erectors is proud of the completed design build project for The Brea War Memorial. Visitors can view the memorial at the Brea Civic Center.